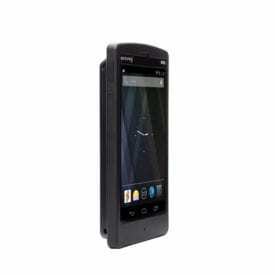 Today Spectralink launched its new line of PIVOT phones. I can’t say that I’ve tried them, but it sure is an innovative concept – bridging the consumer world of mobile with enterprise wireless handsets. The consumer mobile phone has both strengths and weaknesses, so exactly what needs to be leveraged and what needs to be fixed for enterprise use is an interesting undertaking. For example, despite our love affair with these devices, the typical consumer smartphone is too fragile, the batteries are a pain or impossible to change (for shifts), cameras make terrible scanners, and viruses and malware are a growing problem. The new PIVOT line of Wi-Fi devices are smartphones for mobile (within the walls) enterprise users (these are not cellular devices). They are built-on Android (Jellybean), but at this time they are not Google Play store compatible. It seems Spectralink is still pondering the Play store, but it was the right call. They are designed to bridge the gap between friendly/familiar/versatile consumer smartphones and purpose-built, enterprise, mobile, voice capable, computing devices. They are designed to be used with the Spectralink Configuration Management System to load apps or an app store client (I saw one with the Amazon app store loaded). Tough. Consumer smartphones have a 2 year lifespan – tops. That’s practically disposable in enterprise terms. The obvious part is the non changeable batteries (Apple! ), but also ruggedness is not a typical design consideration in consumer mobility. Enterprise phones don’t get the love and care (comparable to pets) as personal devices do. Instead the enterprise devices get dropped, thrown, beaten, and generally abused. Just the antibacterial detergents that hospitals regularly use can wreak havoc on consumer devices. Spectralink went out of its way to make these devices rugged. Mil spec drop test certified, strong plastics, and tough glass are standard features. Battery. We all know the typical smartphone doesn’t hold a charge for long – esp with Wi-Fi turned-on. Even worse, swapping batteries can be difficult and time consuming. Spectralink adds a large 2000 mAh battery on the back of the phone (rated at 8 hours of talk time). Kind of like having a built-in Mophie – but smarter. Of equal importance is a design that makes it easy to change the battery. Just push the button and swap. It also gives the phone a less square shape that makes it easier to grasp (look at that gap of space between the back of the phone and front of the palm). Lastly, and I don’t know if this was an accident or intentional (I’m betting intentional – Danish design), but the battery acts like a kickstand. Yes the phone can stand. I don’t understand modern cell smartphones when it comes to speaker phones – the speaker is on the back and the mic is on the front. Go figure. Industrial chipsets. Apple angered a lot of folks with its Lightening connector because it obsoleted all the old peripherals. Mobile technology is exciting and dynamic, and that is actually problematic for enterprise deployments. Business organizations expect 5 years of life out of their products. Spectralink went with industrial chip sets so it could ensure longer lifespans of the product. Scanner: Some of the phones have a high-end, built-in 2D scanner. This is particularly important for healthcare and retail applications. The touchscreen glass supposedly works with surgical gloves (unverified). I would have liked to have tested this, but I left my gloves at the TSA. Lanyard: These phones are bit too large to be pocketed. They have 4.3″ screens and big batteries. Spectralink offers a Lanyard for that ‘over the shoulder’ casual look . The devices actually look a bit like a Star Trek Tricorder when worn this way. Or, there’s an integrated clip for those that prefer Klingons [sic]. Hard buttons. For easy access to PTT, Power, Volume, Scan (scanner required), and panic (there is also internal sensors for ‘person-down’ feature). Phones are ready for SIP (G.711, multi-line, call logs, directory), and although not currently yet “qualified, ” the one I saw was running the Lync client. Accessories: I like the quad charger. Quick battery swap is only an important feature if one has a bank of charged batteries. I applaud Spectralink for taking-on this redesign, but have just a few suggestions for future enhancements. DECT: I like DECT phones, but I’m in the minority – at least in the US. I contend there just hasn’t been a DECT phone designed for the US market yet. DECT is better for voice and easier on batteries. Quantity packs: I am growing increasingly frustrated with enterprise phones and headsets that are only sold in quantity one. Let’s make things easier on the entire sales channel, the customer, waste/recyclers, and the environment with larger count SKUs. Camera: The current models are camera-less. I’m not sold on mobile video conferencing, but I do like a camera in the device. Just as Spectralink offers a model with a scanner, I’d like to see a model with a camera. I think this is particularly important for facilities/security applications. The initial configuration is done via the Spectralink Installation and Configuration Tool (SLIC) – a proprietary LAN connected USB device. I’d prefer a web interface or cloud based configuration model. The current approach requires a pit stop at IT before deployment. Bluetooth. I’m told it is coming. BYOD does not eliminate the need for a device like this. These devices are meant to be shared devices critical to specific work processes. They are intended to be fit for purpose. BYOD is a question of who pays for and owns a consumer device. Bottom line: This is a new promising platform that bridges wireless phones, apps, and scanners into a single handheld. I can foresee a strong future as the ecosystem of apps, accessories (thermometers, bp cuffs, etc.) and improved solutions expands and matures. It is really a new class of device – the prior generation of Wi-Fi phones were too limited from an application perspective. It might take a little time for the market to fully appreciate the potential of these devices. Actionable analytics is the focus of this year’s Enterprise Connect Innovative Showcase; submit now!